Exterior railings are one of the defining elements of the facade of a home. Each style of home has a style that fits it best, though, more and more homes are blending railing designs. They serve a common purpose: to maintain assurance and guarantee among property owners, and upgrade a property’s overall glance. Undoubtedly, railings are more than just providing protection from unwanted accidents; it can also help bring life to a rather plain-looking home. Thus, railings are considered an important asset in a property. A good railing should also be made from high-quality materials that can last for a long period of time. It should also be cost-efficient in terms of preservation and improvement. In choosing the best material for your ideal railing system, one should look for an income producer that has years of experience and state-of-the-art materials and equipment. 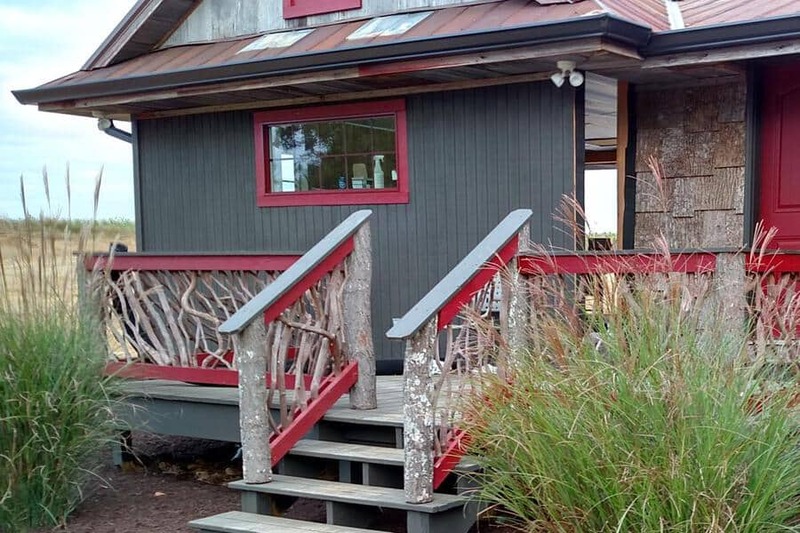 Mountain Laurel Handrails are made by master craftsmen and are a great rustic look. 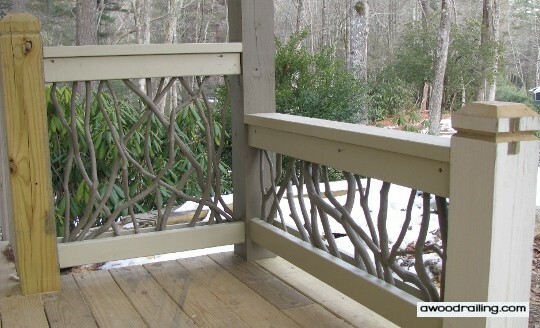 This railing design is based on a traditional form found in the Great Smoky Mountains of Western North Carolina. Modern craftsmen have improved on this form with joinery and preparation techniques to ensure a beautiful exterior railing that will draw compliments from everyone that see them. This stair railing is one example of how many different elements can be included that use the Mountain Laurel wood. And such wood in its form preserves all its character and charm; it will age elegantly with the surroundings, so the external handrail merges into the environment. Wood exterior handrail are composed of an assembly of parts. There are different methods for building them with a variety of materials for decks, but most rails built from wood share a common set of components. Usually, wood posts are attached to the deck frame to provide the support for the rail. Some composite systems require the installation of a wood post that will be covered by a hollow sleeve. The rail system uses horizontal components running between the posts as top and bottom rails to design the frame for the space in between. Likewise, the bottom rail is raised above the surface to allow a sweep space for snow and leaves. A top cap is also used to fulfill the requirements of a stable construction so the last thing to take part is the infill section of rails which is build of branch balusters. The center post of the stairs railing is a larger stick that supports the handrail. The branches come all the way down the side of the stairs and blend the structure with its surrounding. Behind the stairs, sticks extend from the stair all the way to the underneath of the deck. It is especially to admire how the dappled sunlight further blurs the distinction between nature and the built environment. 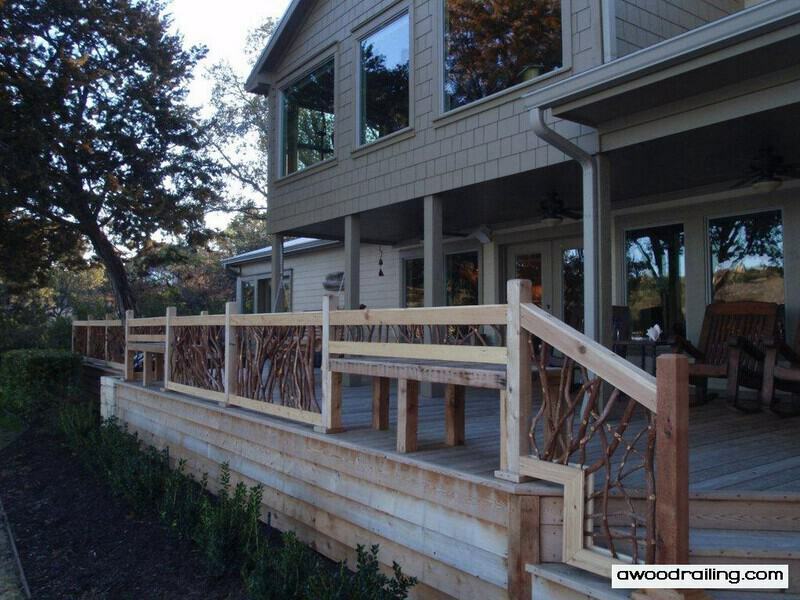 This exterior wood handrail was installed on a bridge over a small stream. The bridge was built with round log posts holding up the timber framed roof. Special pockets were carved in the round posts so that the square lumber of the handrail would fit seamlessly. Large diameter Mountain Laurel branches were used to match the stout look of the covered bridge. These exterior railings tie this bridge to its surroundings by mimicking the organic forms of the forest. 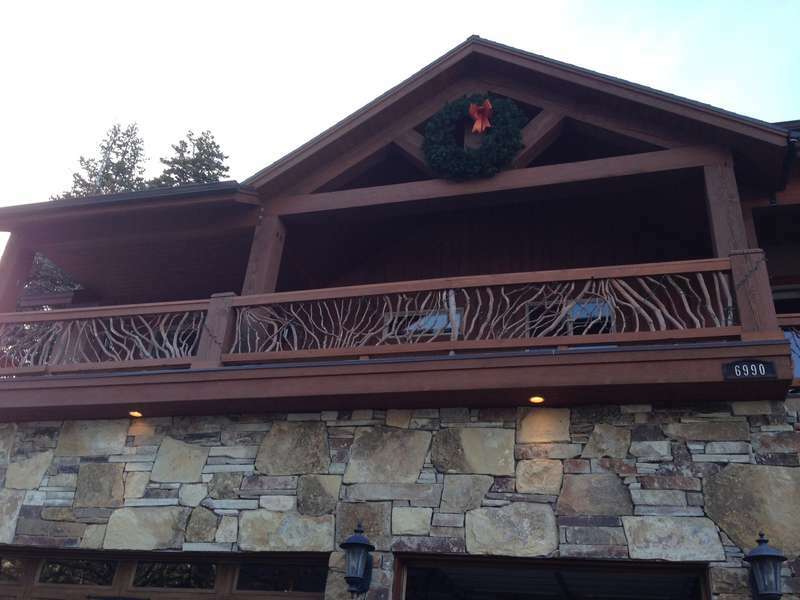 Mountain Laurel wood exterior handrails are composed of wood balusters to create striking designs from branches that have grown into a diversity of patterns. Since each section is individually crafted, no two are ever the same and each takes on its own specific form to create a railing system unmatched in visual interest. Balusters are arranged in a clean minimalistic way, of a lighter color compared to the branches which makes it even more distinguishable and artsy. Tree branches are recycled into functional found art for landscaping. Naturally, the intention was that the handrail for the staircase to harmonize with the trees in the background. After, the bark was peeled from the branch for a smooth handrail. This is a gorgeous design which gives the railing some great character and a large handful of beauty. What are the character defining features of the deck? The open qualities are one of the key features of most decks in general. Overall size, shape and design are apparently important components as well. There are numerous other attributes which may exist, including the way this unique deck is divided into distinct bays as with columns, the nature of the supporting deck foundation, the style and size of railing system, including particular columns and balustrade. The simplicity of the deck design and its simplicity in detail also helps to define it. Materials used seem to be as one well combined continuous layer of wood railing texture. How does the deck influence the building’s overall appearance? The size and location of the deck helps define its significance. The slab of deck across much of the front facade is the most distinctive feature of the actual building. Such architectural style of the deck relates to the building and helps define its character. It is so diverse in terms of style, size, shape and detail, that the significance of exterior railing systems is directly assessed with an understanding of the overall importance and evolution of the existing object. This project started as a 450 SF cottage. Then I added a utility room and single car garage to make probably 900 SF. I used old tin and bark siding plus twig rails to get the look I wanted! The rails came in the specified color and turned out great! Thanks James, I’m looking for another project and I tell everyone I went in woods and made myself! How can exterior wood handrails be viewed from the outside? One of the approaches to perceive the handrail from the outside is to utilize near full exterior handrail kit set behind existing columns in an attempt to retain a feeling of constancy. Such treatment is successful comparing how the appearance on the outside is impacted by lighting, mechanical systems and furnishings. The traditional use of plantings for shade also provides extended privacy. If historically appropriate, new plantings help to reduce the influence of the deck enclosure on a visible elevation. Few architectural features arouse more romantic notions or do more to define a building’s historic character or aspect. The size, style, detailing, and location of exterior porch railings can tell volumes about the age and use of a building. 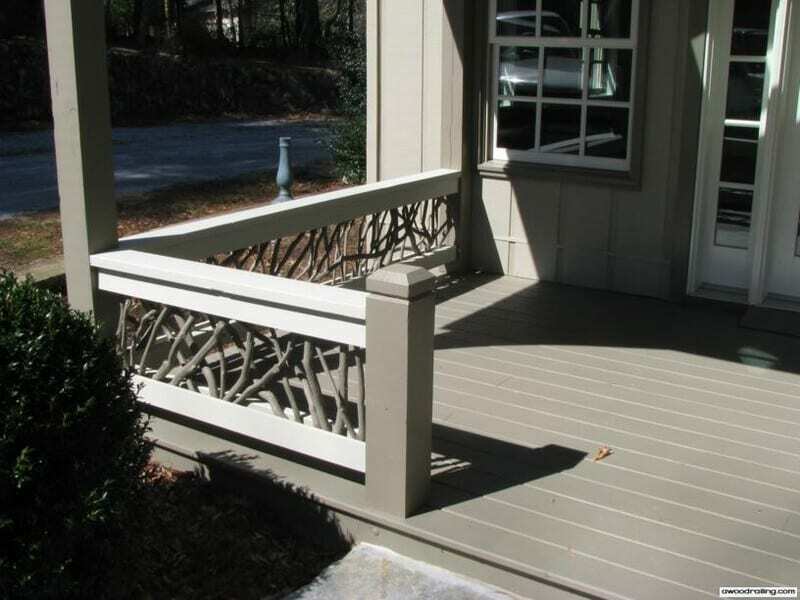 All of the components, starting from handrail to column or post, complements the architectural character of the porch. In case the porch is removed the significant building or street view can lose its visual integrity and historic authenticity. Speaking of the functionality of the porch, it protects an entrance from different weather conditions. Yet open porches made out of Mountain Laurel wood material are constantly exposed to sun, snow, rain, and foot traffic, and thus subject to deterioration, perhaps more than other parts of a building. Enclosed porches are considered to be a transition space between indoors and outdoors and as an association between private and public dimensions. Comparing to grand entrances and sheltered landings with views of the surroundings, porches added to private homes as the above examples serve many of these same functions. With the expansion of population, exterior porch handrails became an integral part of domestic social life. Presented exterior wood hand railing offers quick installation and the ability to create your own choice handrail deck system. The branch baluster deck railing displays a beautiful contrast of linear and bending lines. Sharply squared newel posts and a set of horizontal top rails frame arrangements of these certain branches interweave along the balustrade. The primary reason every deck needs strong railings is simply as a safety insurance. Deck railings can assist with everything from protecting little ones are guarded from the edges of the deck to making it easier for guest to head up and down the deck steps. What is the main role of deck railings? In general, deck railings play the role of basic accessories, however they impact the overall look of your outdoor space and add definition to the property as a whole. This aspect presents the first impression guests will have of the deck. From the installation standpoint, it is necessary to take a look at the local building code requirements to make sure the spacing and measurements correspond to municipal laws. The installation process itself is not too challenging once there happen to be all the necessary equipment and instructions ready to go. Last but not least, deck railing options are very affordable, and feature the utmost condition in terms of performance and durability. Approachable and practical deck railings require considerable relevant features. Firstly, the important element to know about is the framework of the posts, which help keep the entire railing system safe and secure. Along with following building code requirements for spacing between posts, it is needed to install them alongside the house, on the corners of the deck, and at the top and bottom of deck stairs. If you want to get even more creative, choosing a railing system that includes more stylized balustrades or spindles, will add to the architectural application of the front house or backyard. Out of all the materials commonly used for deck railings, Mountain Laurel wood is always a more traditional looking option that can also be extremely flexible in terms of customization. These wood railings for decks are typically inexpensive, and allow homeowners to weigh options for various paint coatings. They appeal to be very strong and durable. How to consider the railing system? It is important to invest in the strength and durability of the wood railing system. Why? The seamless wood deck pattern and railing will be able to accommodate high traffic events, while only needing particular cleaning and minimal repair. What are the features and benefits of deck railing systems? To sum up, no one can deny the purity of natural tree trunks as detailing or for support structure as the ones from Mountain Laurel. They simply imply and employ strength. Wood poles and limbs give countless opportunities for imaginative handrails, structural projects, natural wood deck railing, and textural fills. Branches provide a rich and sometimes amusing detailing that brings the forest in even closer. It imitates the elegance of nature.